Ever wondered how to make these amazing twisty Christmas decorations? They look great hanging from the window, fireplace or of course, the tree! Hampstead Store Manager Daniella Payet shares her amazing technique for making your own this Christmas. First and foremost, you need to choose your colour palette; we went for cool purples and blues for a wintery feel. Cut out 6 pieces of brightly coloured paper into squares of the same size. You could easily make mini versions with sheets the size of a post-it note, or you could create giant sized ones at 30 x 30cm. 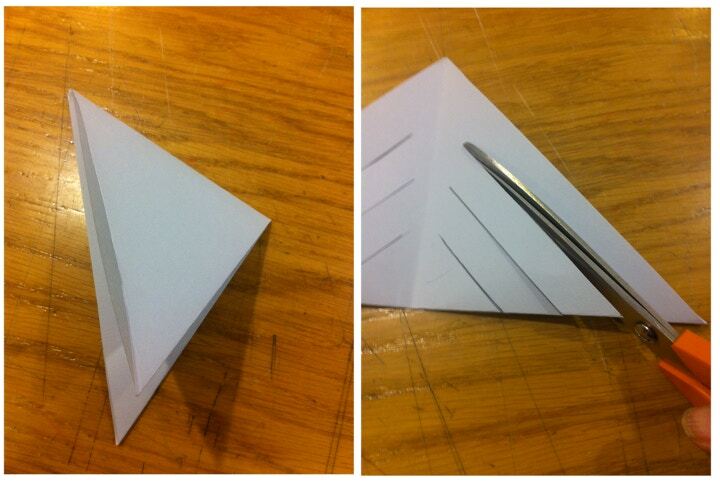 Fold in half to make a triangle and then in half again. 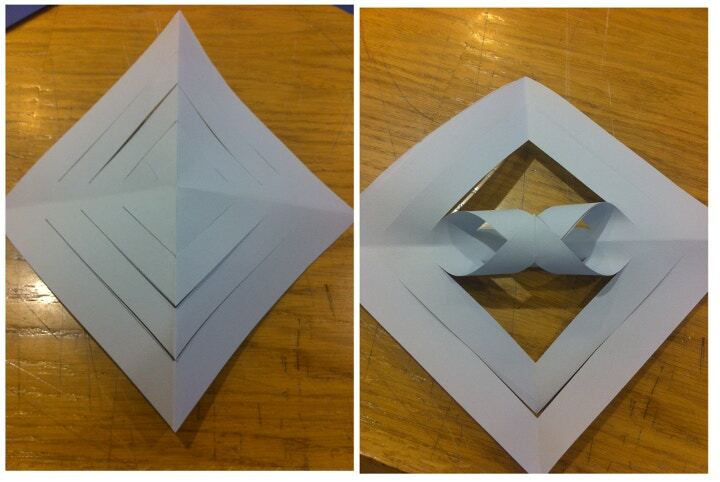 Open up so that the card is a triangle with a fold in the middle. Cut all along the line leaving a centimeter gap on the fold. The larger your snowflake decoration is, the more paper there will be to cut lines into. We measured about 1cm between the lines we cut. Open your sheet of paper out, starting with the smallest square, curl the two corners up to touch each other and secure with a little dot of glue. It’s best to firmly squeeze the two corners of paper together between your thumb and forefinger until the glue dries before continuing. Turn over the paper and repeat on the other side – continue to stick and flip until all the corners are securely glued together. These twists look a little like icicles so you could leave them to be individual decorations at this point or you can create another 5 more to form a beautiful Christmas snowflake. Punch a hole in the top of your decoration and loop the string through to hang up wherever you like! Our Hampstead Store will be host to some wonderfully festive workshops this December, for both adults and children alike, be sure to take a look. Don’t forget to share your work with us using our social photo tool by tagging your work with #cassart #makexmas when sharing on social media such as Twitter or Facebook.